ODESSA, Ukraine -- Strong nerves and a loaded gun are important attributes for a mayor of Odessa, and Eduard Gurvits has both. It is 1am on November 1st. Local elections have taken place across Ukraine. Reports of ballot-box stuffing are already coming in, but other than the odd raised eyebrow and the occasional outburst, the veteran boss of this picturesque Black Sea port remains calm. After having been on the end of a couple of assassination attempts in the 1990s and a few stolen elections here and there, Mr Gurvits is a hard man to surprise. “They used to shoot us. Now they are just trying to cheat us,” he says. As the voting in Odessa had drawn to a close, two trucks had mysteriously appeared in the courtyard of the election-commission building, apparently to store the bags of ballots. But the half-dozen young, thuggish-looking men who said they were “furniture handlers” hired to shift the ballot bags hardly inspired confidence. As TheEconomist went to press the election results in Odessa, and many other regions, were yet to be declared (or decided by Kiev). Mr Gurvits and his main opponent both declared victory. Ukraine’s opposition parties issued a joint statement saying that the local elections were not free and certainly less fair than the presidential election won by Viktor Yanukovich early this year. The list of complaints is long and colourful. It includes allegations of clone parties, refusal to register candidates, and physical violence and intimidation. International observers were unimpressed; EU and American officials criticised the elections. The Odessa campaign was certainly grubby. 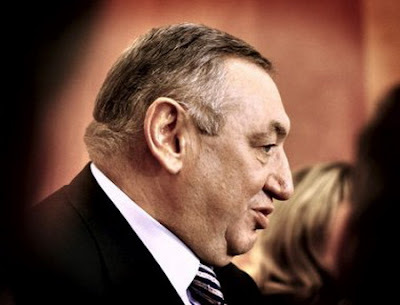 Alexi Kostusev, Mr Gurvits’s main rival, who enjoyed the backing of Ukraine’s prime minister and a regional governor, directed anti-Semitic remarks against the mayor and his family. “Look at his long fingers, his strange eyes, his pointed ears, and you will realise what forces he represents,” he said. The time of independent mayors is over, Mr Yanukovich’s Party of the Regions said in the run-up to the elections. Now everyone has to be part of a vertical power structure, from the president down to local mayors. Yet the local elections were as much about Mr Yanukovich dividing the spoils of his presidential victory among his supporters as they were about consolidating power. There has been plenty of time for that already. In fact, tightening his grip on power has been one of the main features of Mr Yanukovich’s first year in office. Constitutional changes forced through by the president give him powers that exceed those enjoyed by Leonid Kuchma, Ukraine’s president before the 2004 Orange revolution. Changes to the election law blatantly favour the president’s party. Mr Yanukovich’s aides say he needs to consolidate power inside his own party to push through economic reforms, such as cutting red tape and passing a new tax code. It is certainly true that the Party of the Regions is hardly a disciplined political unit. Rivalry between competing factions, each with its own business interests, makes it all but impossible to co-ordinate reform efforts. To overcome the dangers of sabotage from within the government, the administration plans to appoint a number of special “commissars”, selected by McKinsey, a consultancy, to see through planned reforms. The government also says it is determined to fight corruption. Yet so far the law has been applied solely to Mr Yanukovich’s opponents. Supporters of the president allege that the previous government developed a number of staggeringly corrupt schemes. The trouble, says Yulia Mostovaya, the editor of Zerkalo Nedeli, an independent weekly, is that although their operators may have changed, many of these schemes have stayed in place. On the face of it, some of Mr Yanukovich’s steps mirror those of Vladimir Putin, Russia’s former president and current prime minister. But unlike Russia, Ukraine does not have enough resources to carry on without reform. The danger is that if Mr Yanukovich fails to see them through, the temptation to hold on to power by repressive means may be hard to resist. As the Orange revolution showed, this would only push the country into deeper crisis.